Mark Mc Carthy and his cousin Shane Hickey of Kilmurry Ibrickane celebrate following their senior football final replay win over Cratloe at Cusack park. Photograph by John Kelly. 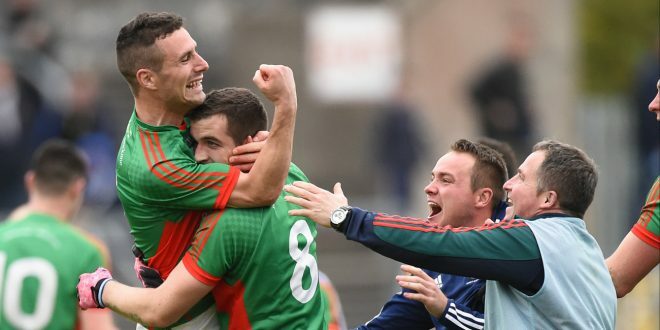 OUTSCORING Cratloe 2-7 to 0-2 in the second half, Kilmurry Ibrickane eased to their first senior championship title since 2012 and their 14th in total in Sunday’s Clare county football final replay in Cusack Park, Ennis. Martin McMahon’s goal, nine minutes into the second half, was the games decisive score, putting Kilmurry into a 1-7 to 0-4 lead. That was Kilmurry’s first county final goal since their 2004 replay win over Éire Óg. 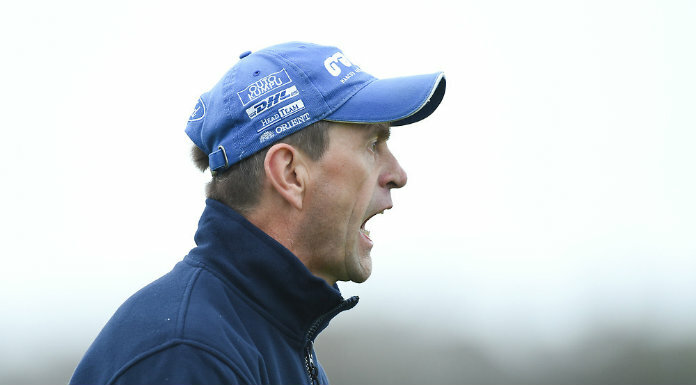 On Sunday, Kilmurry led 0-6 to 0-4 at half-time following a first half which featured both sides defending in numbers, when they didn’t have possession. The key contributor in that half was Kilmurry full forward Peter O’Dwyer who started this time, having been introduced as a late substitute in the drawn game. O’Dwyer kicked a good point and was directly involved in two more of Kilmurry’s first half points. Kilmurry largely rely on a possession based support game but O’Dwyer provided them with a valuable ball winning outlet and he won most ball directed into him. Man of the match Keelan Sexton put over two first half points while Michael Hogan, Shane Hickey with a quality point and Ian McInerney from a free, all found the target. No Cratloe forward scored from play in that half with Óige Murphy attacking from wing back to point, while Cathal McInerney (0-2) and Seán Collins all pointed from frees. Just three minutes into the game, Cratloe’s Shane Gleeson was freed by Podge Collins but his goal effort lacked conviction and went well wide. McMahon’s second half goal was vital, while Kilmurry’s second goal was put away via a Keelan Sexton penalty after Johnny Daly had been fouled. Along with Sexton, Mark McCarthy (0-2), McInerney, Michael O’Dwyer and Shane Hickey all found the target in the second half for the now 14 time champions. The one downside for Kilmurry as they prepare for a Munster club championship tie against Dr Crokes from Kerry next weekend was a leg injury sustained by substitute Noel Downes while Keelan Sexton went into the replay with a hip flexor injury. The fact that Cratloe’s Cathal McInerney was their only forward to score from play indicates where their primary issue was. They also kicked several balls into Kilmurry goalkeeper Ian McInerney. Keelan Sexton was outstanding for Kilmurry for whom Darren Hickey, Ciaran Morrissey and Peter O’Dwyer also played superbly. Few Cratloe players had a good hour but among those who did were Óige Murphy and Cathal McInerney. 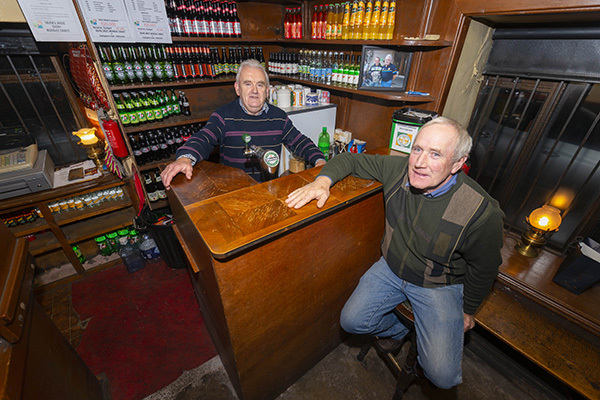 A more detailed report along with analysis and interviews will be published in Thursday’s Clare Champion. Kilmurry Ibrickane: Ian McInerney; Ciaran Morrissey, Darren Hickey, Mark Killeen; Darragh Sexton, Martin McMahon, Declan Callinan; Mark McCarthy, Keith King; Michael O’Dwyer, Shane Hickey, Michael Hogan; Keelan Sexton, Peter O’Dwyer and Enda Coughlan. Subs: Noel Downes for Declan Callinan (41), Niall Hickey for Noel Downes (48-inj), Evan Talty for Ciaran Morrissey (56), Thomas O’Connor for Mark McCarthy (58) and Johnny Daly for Michael O’Dwyer (60). Scorers: Keelan Sexton (1-4, 1f), Martin McMahon (1-0) Shane Hickey and Mark McCarthy (0-2 each), Ian McInerney (0-2f), Michael Hogan, Peter O’Dwyer and Michael O’Dwyer (0-1 each). Frees for: 25, wides: 8, yellow card: Enda Coughlan. Cratloe: Pierce Deloughrey; Seán Chaplin, Barry Duggan, Liam Markham; Óige Murphy, Michael Hawes, Enda Boyce; Conor Ryan, John Galvin; Shane Gleeson, Seán Collins, Antoin McFadden; Cathal McInerney, Podge Collins and David Collins. Subs: Conor Cooney for Antoin McFadden (13-inj) and Stevie McHugh for Shane Gleeson (41). Scorers: Cathal McInerney (0-4, 3f), Óige Murphy and Seán Collins (f) (0-1 each). Frees for: 26, wides: 5, 45s: 1, yellow card: Conor Cooney. Red card: Conor Cooney.